Relax your way to health; invest in a sauna. Have you ever wanted to improve your health by exploring additional avenues, possibly even high-tech options? An infrared sauna may be a great addition to a balanced diet, daily vitamin and of course, healthy sleep habits. 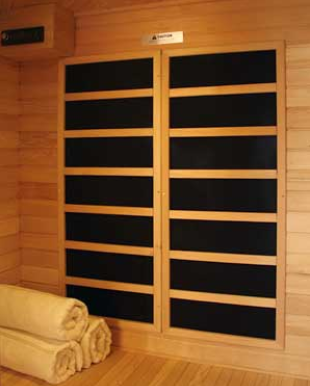 The infrared Sauna has a technology far superior to the older models you may be acquainted with. The heat doesn’t actually raise your body temperature by using steam, rather, it makes the same rays that come from our biggest star: the sun. It filters out the harmful UV rays that can damage the skin so it only gives you the infrared, which is the least dangerous. In turn, you don’t heat up to a broiling point, feel dizzy or light-headed. In fact, the infrared sauna is recommended to people who, due to aliments, may not be able to tolerate high heat in general. The desired residual results from the use of an infrared sauna are lower blood pressure, an increase in blood circulation, a faster and longer burning metabolism rate, the release of toxins and a chance to be relaxed without the intrusion of life’s electronic gadgets. In today’s fast-paced society, it is rare to find the perfect blend of technology and nature that actually delivers results--results that happen in the comfort of your own home--no need to drive to a gym or visit a workout center. So if you're considering exploring the purchase of a sauna for rest, relaxation or simply improving your health, now is a great time. 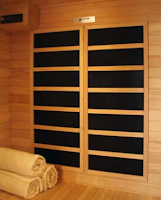 Embark on a tried and true method of restoring your health through an escape into an infrared sauna.